Now that it’s clear why sleep is so important, here’s how to get more sleep to be more productive. For moms with babies and toddlers who still don’t sleep through the night (especially during those endless teething months! ), I advise that you just do your best to sleep when you can. Squeeze in power naps when the kids are napping and keep your daily routine simple so you’re not too hard on yourself! For those of us who are past those pre-K years, the culprit isn’t usually our kids’ sleep schedule, but #allofthethings that need to get done for them, for you, and for the household in general! Try these 4 steps to get a handle on your sleep and boost your productivity. I’m really emphasizing realistic here because in today’s crazy busy world, especially as working moms, it’s difficult to have a consistent routine. Instead of telling yourself to be in bed at 9 PM every night, give yourself a flexible time range that you can stick to—for example, try to get to bed sometime between 9 and 10 PM every night. Creating a nighttime routine for yourself is more than just sticking to a bedtime, though. Establishing certain habits before heading to bed can help train your body that it’s time to sleep. It’s also a great opportunity to cross a few more items off your to-do list and maybe create a fresh to-do list for the next day. Before heading to bed, make your morning simpler by getting some tasks out of the way now. Pack the kids’ lunches the night before and lay out your outfit for the next day. Through it all, start to wind down mentally so that you can fall asleep easier. The more prepared you are for the next day, the more productive you’ll be with your time! After a long, hard day of work and mommy responsibilities, you may be tempted to have a glass—or 3—of wine once the kids are asleep. I know I am! Contrary to popular belief, alcohol can actually cause sleep disturbances. While one glass likely won’t do much damage, drinking more than a couple glasses of liquor before heading to bed can cause disruptions to your sleep later in the night, leaving you feeling sleepy the next day. Smokers should also avoid nicotine before bed as they can go through withdrawals while asleep, resulting in interrupted sleep. I’m not saying that you shouldn’t watch your favorite TV series before bed, just don’t start watching it too late! Give yourself a few minutes of time after you’ve turned the TV off to unwind before heading to bed—this will make it easier to fall asleep. And, as tempting as it is, don’t break out your smartphone to catch up on social media once you’re in bed. The backlight can suppress the chemical in your body—melatonin—that tells you it’s time to sleep. Plus, if you like to read before bed, try to read an actual paper book or magazine instead of your phone or tablet (for the same reason). Exercise improves your ability to fall asleep and stay asleep longer. It also helps increase your REM sleep cycle, the deepest, most rejuvenating part of sleep. Without it, you wouldn’t wake up feeling refreshed and ready to tackle the day’s tasks. But, since exercise gets your blood pumping, it also raises your internal temperature and increases adrenaline—all of which can make it hard to fall asleep. So try to get your exercise in long before it’s time for bed. Most Importantly, Make Sleep a Priority! 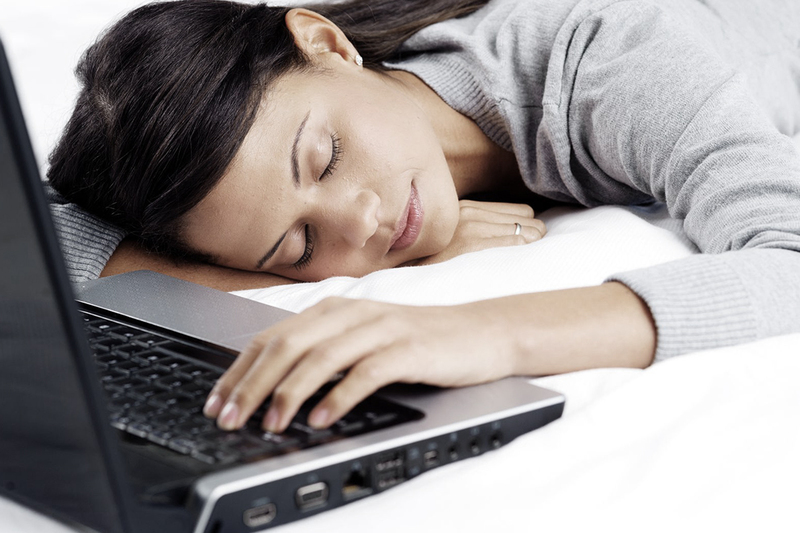 Sleep and productivity are directly linked. There’s so much more we can all do to improve our sleep, but the key is that you should make sleep a priority—just like eating, drinking, and staying active. Sleeping more will prepare you for tackling your busy day and clearing off your to-do list efficiently. If you get enough sleep to function at your best, you’ll be well on your way to being a productive, successful, happy mom. For us moms, it’s always a balancing act to get enough sleep to function throughout the day and still accomplish enough on our to-do lists. Many of us think that in order to be successful, we need to wake up early and burn the midnight oil. But we’ve also been told that getting sufficient sleep is essential to our overall health. So, what if we want both, productivity and improved health? Well, we can have both—because more sleep leads to increased productivity! Science has shown that we need a healthy amount of sleep every night to be productive during the day. In the next two articles, we’ll tackle the tough topic (for moms!) of sleep—why it’s so important, and how to get more done while still getting more sleep! First things first: Here’s why sleep matters so much. If you’ve had a newborn, then you’re familiar with the negative impact that lack of sleep has on your energy level and productivity! We all have days when we drag ourselves through the endless hours with lots of caffeine and still struggle to focus. According to a study by The National Center for Biotechnology Information (NCBI), sleep deprivation impairs our alertness and attention, negatively affecting certain brain structures and functions. All of these adverse neurological impacts also have an effect on our productivity. If we’re constantly drowsy and our attention is fleeting, no wonder we’re accomplishing so little during the day! We’re also more likely to make mistakes when we’re tired, meaning that we spend more time correcting our errors. Getting enough sleep in the first place keeps us from having to backtrack to fix something and waste precious time! If you’re like me, when you’re tired, the last thing you want to do is make decisions and deal with a never-ending list of daily responsibilities like work, chores, and helping the kids with homework. It’s exhausting just thinking about it! When we wake up tired, we’re much more likely to push off difficult tasks for another day, which just means more work is piling up and adding to our ongoing overwhelm. When we’re well-rested, on the other hand, we’re more likely to tackle the day’s tasks instead of procrastinating. We’ll also be much more willing to attempt the more difficult, important tasks on our to-do list when we’ve had enough sleep—like taking the car in for service, filing that health insurance claim we’ve been putting off, or helping our child with their science project. But HOW Do I Get More Sleep?! I get it, there are only 24 hours in a day and something has to give, right? Well, not if you’re strategic about managing your waking, and sleeping, hours. In my next post, I’ll share some helpful tips for getting more sleep and getting more done while you’re at it. Yes, it is possible, I promise! Are You More Productive When You’re Busier? Do you ever feel like there just aren’t enough hours in a day? As working moms, our days are stacked with responsibilities—pick up and drop off the kids, make that work meeting, finish a work project by the deadline, cook dinner, and more. With all this stuff to do, we’re always too busy, and productivity tends to fall to the wayside. All our energy is focused on the day-to-day tasks just to get the bare minimum done. Being “too busy” becomes a regular excuse—a crutch to avoid the hard tasks that might actually bring about positive change in our lives. We get caught up in an endless cycle of being busy, stressed, and exhausted as we just try to make it through the day. No shame, moms. There’s nothing wrong with being busy (it’s kinda hard to avoid it with all the multi-tasking we do!). But if we shift our mentality from “busy” to “productive,” we can get a lot more done and be happier while doing it! According to recent studies conducted by researchers from Columbia University and three other institutions, keeping busy helps keep people motivated, despite time limitations. Think back to the last time you missed a deadline—not because you were too busy, but because you simply were too tired or lazy to do it. You probably felt pretty bad about it, but you didn’t necessarily make an effort to follow up on the task. According to research, the busier you are, the more likely you are to feel like you’re using your time effectively, even if you miss deadlines. And if you do miss deadlines, you’re more likely to return to those tasks sooner and actually get them done. So, if you really want to tap into those mom superpowers (you know you have them!) and get more stuff done, you need to stay busy and productive. This doesn’t have to involve stress, though. All you have to do is change your mindset and get organized. This list is strictly for things that absolutely have to get done today. Do your best to write out the list the night before. And don’t make the mistake of adding more items. Forget about what you want or wish to do. Focus only on what must be done, but what will bring you closer to your goal. Let’s say your goal is to leave your job and start a business from home. Something you could put on your list is, “research how to become a work-at-home-mom.” This is something that’s steering you towards your goals. You don’t need to write down “pick up the kids” since that’s something you were going to do anyway. Working harder is good, but if you want to be productive you have to work smarter. But how? Up Your Time Management Game: Apart from writing a list, get rid of distractions. Switch off (or silence) your phone (okay, you still want to be available in case of an emergency, so settle on a reasonable amount of time to go without checking your phone and set an alarm reminder to check for urgent messages at each time interval). Disable your social media apps. And minimize multi-tasking! While multi-tasking can be unavoidable at times, focusing on one thing at a time will help you accomplish tasks more efficiently, which in turn will reduce stress. Take Frequent Breaks: Working hard can be draining. Take time to refuel and refocus. Do fun stuff with the kids. Go for a walk around the block. Giving yourself a break will leave you feeling energized and motivated. Why keep plodding along for three hours when you could take a 5-minute break, return to the task at hand, and be done in one hour? Be Flexible. Keeping a list and planning things out meticulously is great. But life happens, especially when you’re a mom. You’ll soon find that being rigid with your plans will not result in productivity. Be willing to modify your day if something unexpected arises, and don’t beat yourself up about it. Similarly, if you’re making great progress on a task and you can afford to invest another hour into it, don’t stop because you’ve hit your original time limit. Use that momentum to your advantage! Productivity is something we all aspire to, but it can sometimes feel daunting. When we set our minds to do something but fail to accomplish it, we often become demoralized and abandon the goal altogether. Don’t give up so easily! As working moms and corporate women, we have a lot on our plate. Remember, you’re already doing a great job—don’t discredit yourself. Spend a little time getting focused, and soon the days of “I don’t have time” and “I’m too busy” will be behind you!